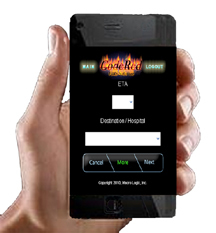 CodeRed Mass Casualty - CodeRed EMS - Just part of the CodeRed Enterprise Software Suite of Products for Smartphone, Tablet, iPad, Android, Tablet PC. Get the latest CDC Mass Casualty Preparedness information. The “Mass Casualty” report is streamlined to provide Medics the ability to acquire the needed information in a Mass Casualty scenario in the least possible time. All screens are designed with accuracy and speed in mind. Since no two incidents are alike, you have the flexibility in the field to set the pace you need based on the incident. 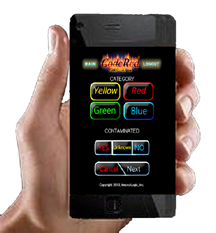 The Patient’s Triage Category and suspected Contamination are a simple one-button click. The Patient Info page pictured here utilizes the same ease of entry used in the Hospital Report side of the Patient’s basic information while including the Patient’s Triage Tag ID Number. There are no required, or minimum number of fields entered. You Just Assess ‘n Go. Destination and ETA can be completed here or by the Mass Casualty Command Center, again providing the control and flexibility to deal with the incident at hand.